Reftec International Systems, LLC. is now handling distribution of the Corken line of industrial compressors. T-style compressors can handle the same applications as a D-Style compressor. 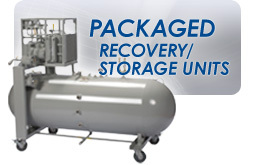 These include transfer of liquids between tanks, off-load/load out liquids, recover residual vapor, pressure boosting, etc. The T-style, however, offers the advantage of precise leakage control. The T-style compressor was designed to provide maximum leakage control when handling toxic, hazardous, and explosive gases. Corken offers a broad range of material options. Corken also offers various corrosion resistant coatings, valve options, and equipment configurations. Corken supplies custom engineered packages as well. Skid mounted units can be supplied with control panels, safety controls, receiver tanks, liquid traps, and other special accessories as required. Designed for improved leakage control, this option has three separate sets of packing per piston rod which effectively form two distinct distance pieces or barriers to external leakage. Each distance piece has its own line connections and can be separately pressurized, purged or vented to provide a wide range of application flexibility. For added convenience, purge kit options are available that include all the accessories needed to control the purging or pressurization of each chamber. Corken compressors are designed to minimize required maintenance and make such maintenance extremely simple. Valve replacement may be accomplished without disturbing the piping and ring replacement may be accomplished by simply removing the head. Corken offers a broad range of models and corresponding piston displacements. The oil-free units range from 7 to 60 cfm (11.9-102 m3/hr). Depending on the compression ratio, Corken provides either single- or two-stage compressors for efficient gas compression.